Our last day in Copenhagen we spent enjoying Stroget some more. David and I walked around the streets and enjoyed the beautiful scenery and stopped at the Royal Copenhagen shop to buy some gifts. I saw this adorable ice cream cart and just had to take a picture. I wanted to hop on the bike and peddle as fast as I could away with it! Isn't it dreamy? 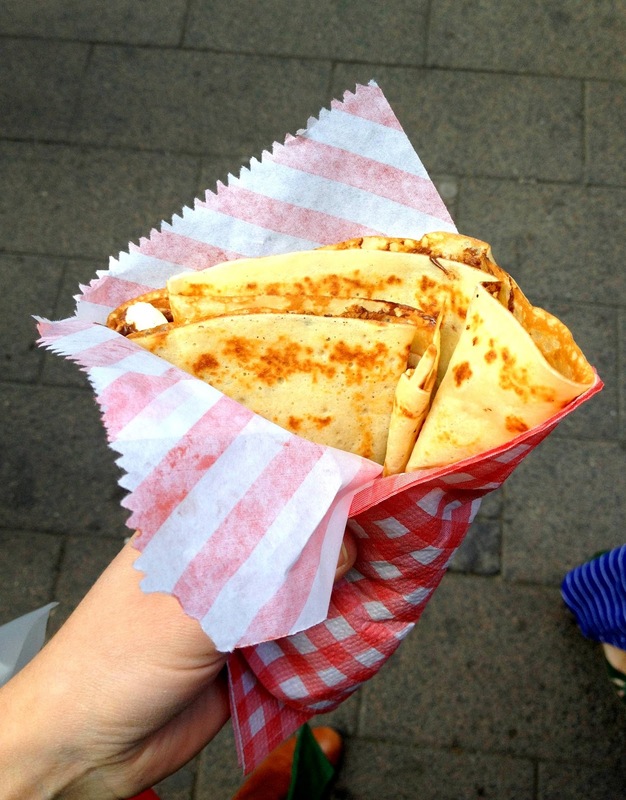 And I enjoyed another crepe with Nutella. Yum! By the way, this post is going to include a LOT of pictures of food! Oh, let's get real! Almost half of the 400 pictures I took on this trip were of food. I'm not ashamed (very much)! Then, of course, we had to stop at the Lego store. Did you know that legos were created by a Danish carpenter? It only seemed fitting to get William his first set of real legos in Denmark! I'm so glad we did! The coolest part was that this entire wall was made of legos and this lady and her motorcycle were also made of legos. It was pretty awesome and everyone wanted a picture on it so I had to smile awkwardly while everyone waiting, looked on. I also loved this lego display of the Nyhavn buildings. It was so beautiful! We met the rest of the family back at the train station with all our luggage to go to Ystad so we could catch the boat to Bornholm. Unfortunately, we had a bit of an issue with our train schedule so we ended up having an hour or so to kill. 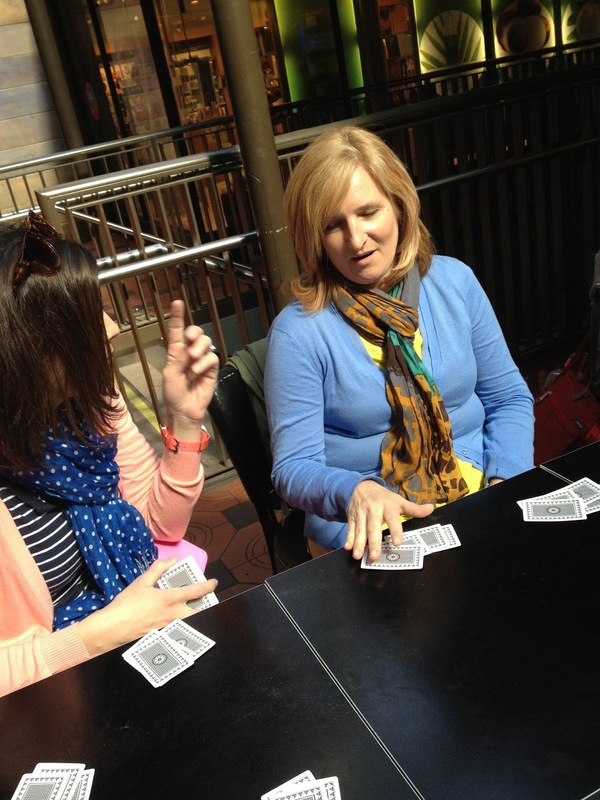 Fortunately, Sarah bought a pack of cards and we played game after game of Kemps to pass the time. I really love hanging out with my family. Also, while we were waiting for our train, there was this adorable bakery across the street next to Tivoli Gardens called Andersen Bakery. We each took turns with the luggage and ran over there for some treats. I asked the lady behind the counter which was the "most Danish" and she said this one - tebirkes (flaky puff pastries filled with marzipan and sprinkled with poppy seeds). It was soooooo good but I had to brush off about 3/4 of the poppy seeds. It was a lot! Once we arrived on the island of Bornholm, we picked up our rental cars and each went our own ways for dinner. Funny side story: when my brother Stephen made the reservations for my dad, he had the lady book six cars (two couples to a car). Before we left on the trip, he called to confirm and the lady said that she had cancelled five of the reservations. Stephen asked why and she said very frankly, "One person cannot drive six cars. It's just not possible." We laughed and laughed at that! I guess she's right! We had no plans for dinner so everyone was on their own. Most of the family had dinner at the hotel (which they said was very good) but Stephen, Leone, David and I were in one car and we found Restaurant Poul P on Trip Advisor so we stopped there. We sat down at the table and just as we were ordering, my brother Peter and his wife, Darin and my sister, Heidi and her husband, Josh, walked in! It must have been kismet because it was one of the most tasty, fun dinners I've ever had. As we sat there eating our delicious food, laughing and talking, I couldn't help but think "You know. I really love my family but I also just really like them." I know a lot of people don't feel that way about their siblings and I feel really blessed to have them in my life. David's hamburger - with black hummus and amazing roasted potatoes. my delicious salmon with house made pasta and saffron sauce. As we were eating our dinner in this very tiny and artsy restaurant, this big guy kept coming over and saying unusual things to us in a very excited, boisterous manner. I was fully convinced he was totally sauced but as we talked to him more and more, I figured out that this was just his friendly personality. Turns out he is the owner/artist of the restaurant and had his art studio next door. After we ate our dinner, Poul had asked us to come check out his art studio so we walked over there and browsed around. When he was telling us about his artwork, he mentioned that Pamela Anderson and Lindsey Lohan were really fond of his work. I thought that was funny. He was a nice guy and had some really sweet sayings on his art work. Later, I found this picture on Pinterest and turns out - he wasn't exaggerating about Pamela! The best thing Poul said that night was when he was telling us about dessert. He mentioned that they had something called a "bleeding cake" (which turned out to be a molten chocolate cake). When he described it, he said, "Your right eye will cry when you see it and your left eye will cry when you eat it." We laughed at that but he had the last laugh, because it was epic! It was so cool because the cake crackled and popped as we were eating it. We were so full from our dinner that we got it two to share and it was gone in 60 seconds. And yes, that is apple ice cream if you were wondering! It was a sweet way to end the night . . .
oh that looks delicious! and your camera takes great photos :) can't wait to see more of bornholm! and, you should check out the "wallander" movies on the internet. maybe on netflix? they are filmed in ystad. i love them!